A lovely piece of Royal mail arrived today. 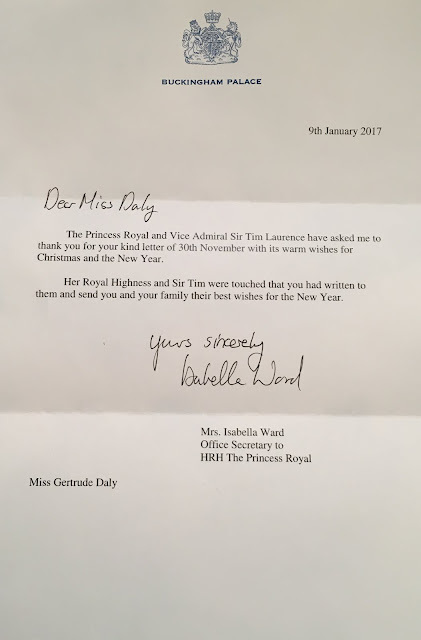 The letter is from Princess Anne and her husband, Vice Admiral Sir Tim Laurence. I had written to the couple in Late November to wish them a Merry Christmas and Happy New Year. The letter was written January 9th, postmarked January 12th, and arrived today January 23rd. So in all it took a bit less than 2 months for the reply to arrive, which for Princess Anne is a bit surprising. With my previous letter to her, Princess Anne's office had done the amazing job sending out a reply within days of receiving my letter. Obviously with a busy time like Christmas it's completely understandable they are very busy and it would take longer. The letter is like the typical reply from Princess Anne's office. What is interesting is reply was sent from Mrs. Isabella Ward, Princess Anne's Office Secretary. (An office secretary is a few steps down from a Private Secretary.) This is the first time I have gotten a reply from her. My previous replies have all been from Commander Anne Sullivan of the Royal Navy. She is Anne's Assistant Private Secretary. I've gotten replies for about 40% of my Christmas letters so far. So I have still got a lot more waiting to do, although there are some I don't expect to get a reply from. I know last year I got about 1/3 of my replies in February, and it looks like that will happen again this year.